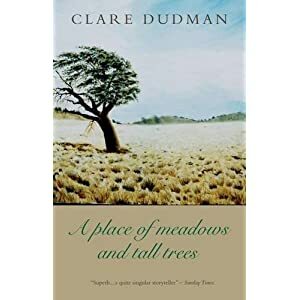 Before reading Clare Dudman's new novel, A Place of Meadows and Tall Trees, I was only vaguely aware of a Welsh presence in Patagonia. I knew, in a Trivial Pursuits kind of way, that there was a pocket of Welsh speaking down there in South America, and I had the bizarre fictional images from Malcolm Pryce's wonderful noir detective stories set in a fantasy Aberystwyth (like Abertystwyth, Mon Amour), where Patagonia is frequently referred to as the Welsh equivalent of Vietnam, with war veterans cropping up in the stories now and again. But I knew nothing of the real nineteenth century attempt to colonize part of Patagonia. Although the book is a novel it really does capture the historical context beautifully - you can feel the hardship of reaching the place, only to discover that the promised meadows and tall trees are actually scrubland and bare earth. The colonists battle against remarkable odds, losing loved ones (particularly poignantly, several of the children of the central character Silas James) and nearly starving. They survive because of three factors - help from a local Indian, support from Argentina (which wants to make sure that the area isn't annexed by Chile) and the idea of Silas' wife to irrigate the fields rather than rely on very random rainfall. The main thread of the novel, featuring the colonists and the difficulties of deciding whether to keep on trying or move to Argentina proper can't be falted. I wasn't quite as convinced by the interlaced sections seen from the point of view of the Indian Yeluc. It's just so difficult to present such an alien view without seeming a little contrived. Having said that, the author avoids the common modern assumption that everything the ancient wisdom of the Indians says is beneficial. It's true that the colonists learn a lot from the Indians, particularly about hunting, but equally the Indians learn from the colonists. If I mention a couple of small negatives it isn't because they in any way spoil the book. One is that Clare Dudman is just a little too subtle. She could have made more of the irony of the Welsh moving to Patagonia to preserve their language and culture, only to contribute to the supression of the Indians' language and culture. And I found the ending rather puzzling (I really can't say much more without giving too much away). But that doesn't take away from this being a really engaging read. The author is always wonderful at giving us a feel of what it's like to live in a different environment, and I've never seen it done better. Lyrical and informative in equal parts, this is a novel that a non-fiction reader can appreciate for its descriptive content while still giving flight to the imagination and good development of characters that the reader cares about. Recommended.